Also for South park fans - The new series begins tomorrow night at 10pm (uk time) on Comedy Central. Certainly does, they showed the Emmy winning episode Margaritaville last week to get us in the mood. Lucidity is brilliant, atmospheric, mesmerising and the music is hauntingly beautiful. It's also slow and boring. South Park LGTDP! is a bit weird for a Tower Defense game as you get to be the characters and throw snowballs ... it's different, i want to not like it, but i got strangely addicted to it and played for about an hour last night. There have been so many people buying Battlefield 1943,but not one of you here! It's on my buy-list, but I promised myself I would only buy "Deal of the Week" items from now on. If you want to play some Hasbro Family games, holla atcha boy. Major Nelson has given word on tomorrow's Xbox Live Arcade releases. They are NBA Unrivaled, Encleverment Experiment and 0D Beat Drop. They've somewhat inevitably been sent to die, given it will be the day after Modern Warfare 2 is released, but 0D Beat Drop looks like it could warrant some attention - it's a block-dropping puzzle game that incorporates rhythm action and lets you use your own soundtrack too. It will cost 800 Microsoft Points, as will Encleverment Experiment. NBA Unrivaled will cost 1200 Microsoft Points. I want to play. Lets all play come on sarge. We can have a blast on Sorry!! I thought it said have a blast on sarge on first reading! I don't think I've got sorry.Won't take long though! To help Americans celebrate Thanksgiving in a not-that-retro style, Microsoft will next Tuesday be offering two new games for download via their Games on Demand service. The first will be Saints Row 2, only a few short months after the release of the first Saints Row on GoD. If you didn't get Saints Row 1, get this one, it's much better. The second is LEGO Indiana Jones: The Original Adventures, which arrives just in time to undermine the release of LEGO Indy 2, what with the older game blessed with the absence of any Crystal Skull content. And while they're being offered to celebrate Thanksgiving, those outside the US aren't being overlooked, as both titles will be available most other places on Earth as well. 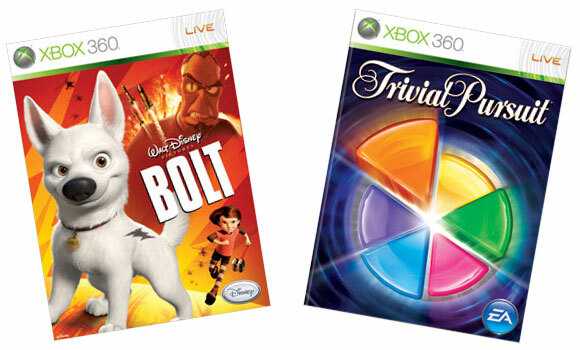 One of the more convenient (and pricey) methods for games acquisition -- Microsoft's Games on Demand service -- has just added a pair of new titles to its North American library: Disney's Bolt and EA's Trivial Pursuit. Each can be yours for $19.99, granted you have the respective 5GB and 2GB of space for each. Prices and availability vary by region, but the insatiable, shameless desire for Achievements that would drive you to actually purchase these games is universal.